ricotta stuffed shells for supper . 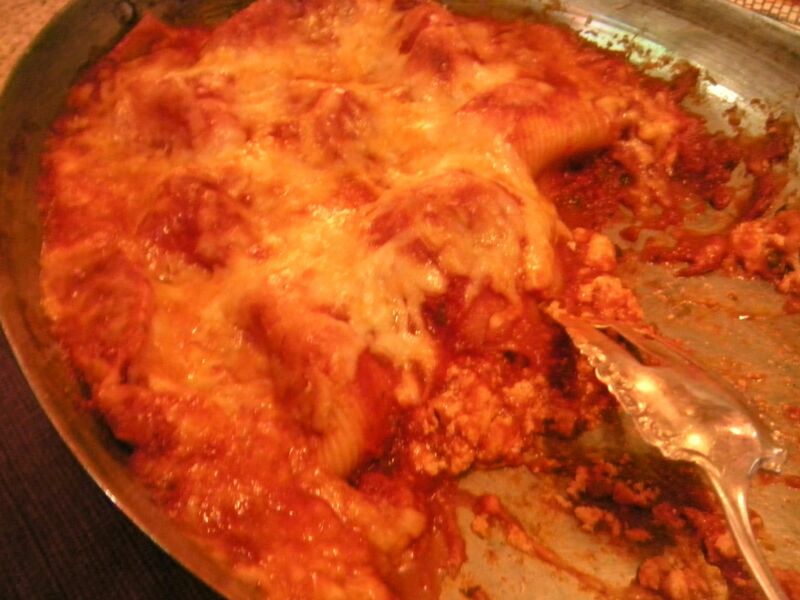 . .
giant pasta shells stuffed with whole-milk ricotta, grated romano cheese, a beaten egg, fresh thyme leaves, chives and basil leaves rolled up and cut into strips; filled shells placed face down on a thin layer of tomato sauce, then napped with more marinara tomato sauce, a healthy helping of grated mozzarella cheese and grated fresh parmigano cheese on top. The quality of the cheeses makes all the difference, it seems to me. Unlike lasagna, the creaminess of the ricotta herb filling balances the acidity of the tomato sauce. As a side, a caesar dressed hearts of romaine salad. simply scrumptious!